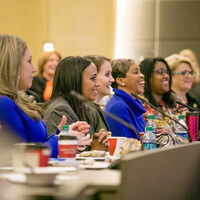 Enjoy networking and learning through keynote speakers and panel discussions with industry leaders, female executives and mentors. Registration required. No refunds available. We’re sorry, the Terry College Professional Women’s Conference is sold out. Please visit our Terry College Events page to view other upcoming events in your area. Thank you for your interest and support of the Terry College!